"Good time woman / Gets every one that she can / When she don't like her own / She gets every other woman's man." 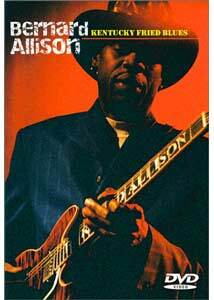 You can tell that Bernard Allison is a serious blues man just by looking at his hat: above the brim, replicas of two nasty snake heads bare their teeth and flick their tongues. You don't want to mess with this guy, or his hat. Allison was recorded at the 1999 W.C. Handy Blues and Barbecue Festival, in Henderson, Kentucky, and he and his backup band offer a hard-driving hour's worth of classic old Mississippi delta blues. As the credits roll, Allison exits through the crowd, and the audience seems to be having as fine a time at the festival as the musician on the stage. The only down side: it runs less than an hour. Image Transfer Review: Things are a little fuzzy and lacking in resolution; and the cameramen scurrying around the stage during the performance get a little too much screen time. But these are the perils inherent in capturing a live event, and the transfer seems to have been done adequately enough, though there's some debris and other bits of interference that mess with the image quality. Audio Transfer Review: THIS IS A VERY LOUD DISC. The 5.1 track is preferable, as the PCM track sounds a little muffled; some pops and ticks can be made out on the soundtrack, but before you watch it, be certain that you set the volume to a very low level, because anything higher may well blow you across the room. Extras Review: A six-panel bio of Allison is offered, along with an option to switch the language of the menus, to English, German, French, Italian or Spanish. It's a good solid hour of blues�the only thing missing is the accompanying plate of barbecue.